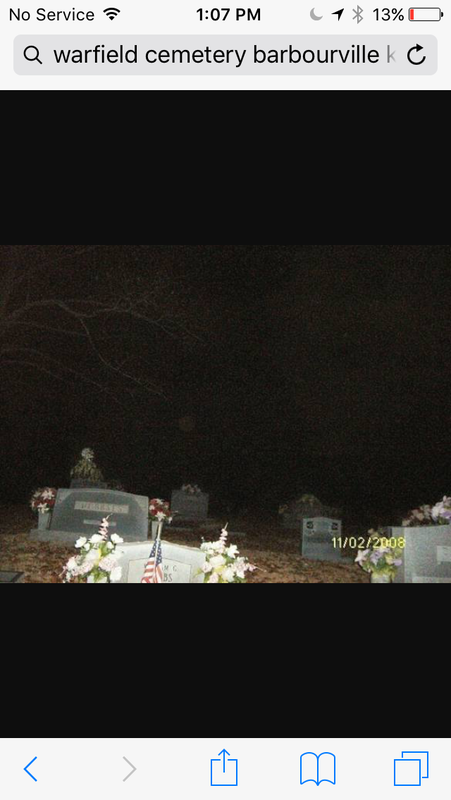 Some claim that at the Warfield Cemetery, something unseen will follow you, moving as you do, terrorizing you as you walk through the graveyard, never stopping until you step outside the gate. What gate? There is no gate!!! I’m thinking and I’ve heard there is another Warfield cemetery off 459 that this is not the right one because this one does not have a gate. There is no gate, no fence, it’s just kinda out there near walker memorial park on 459. I think many of the stories are crossed with the stories from Warfield cemetery in the city of Warfield and vice-versa. definitely some not so friendlies in the Barbourville Warfield cemetery. No. There is not gate but there is a very small bridge and a bench nearby. My freinds and I went there one time and we heard sticks breaking and leaves moving as if something was there but there wasn’t. It was extremely dark. The only light we had was our flashlights and the headlights of our car. It’s a really creepy place. The deaths on the tombstones date back to the late 1800s until now. I didn’t take this picture but it is the same cemetery. I’ve been there more then once. It’s a beautiful sight in the day but a creepy one at night.